The first installment of your property tax is due annually on November 1 and is considered delinquent if not paid by December 10. (If the delinquent date falls on the weekend or holiday, the delinquency date is the next business day). The second installment is due annually on February 1 and becomes delinquent if not paid by April 10. Payments received after the delinquent date are assessed a 10% penalty, plus a one time $10.00 cost on second installment payments. All homes in San Marcos built between 1988 and present are part of a Mello Roos District (aka Community Facilities District, CFD). 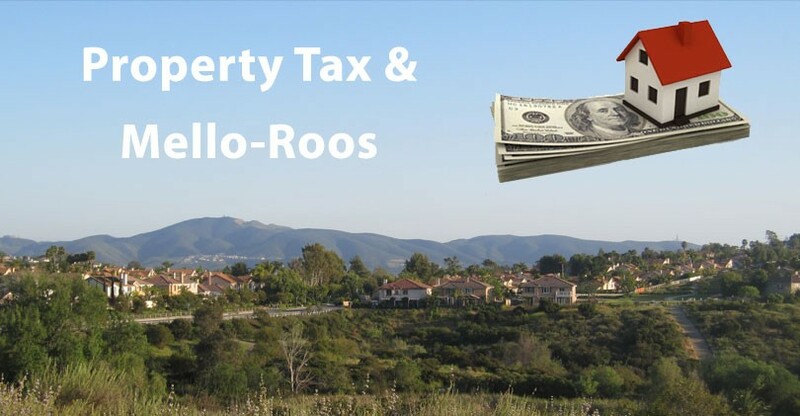 A Mello-Roos District/CFD is an area of homes in which homeowners are obligated to pay a special property tax on top of a standard property tax. This special tax is used to help pay for many of the same facilities and services that a standard property tax pays for, such as streets, water, sewage and drainage, electricity, infrastructure, schools, parks and police/fire protection. To learn more about the purpose and function off Mello-Roos, please see the links below. 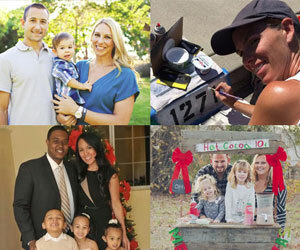 Learn more about Mello-Roos: What is Mello Roos? Learn about the history of the Santa Fe Hills Mello-Roos: Judge Throws Out Mello-Roos Tax Suit Against Developer (Note: When reading article, please be aware that Santa Fe Hills was previously known as Paloma). Read the 1998 Workout Agreement that changed the Santa Fe Hills Mello-Roos district. 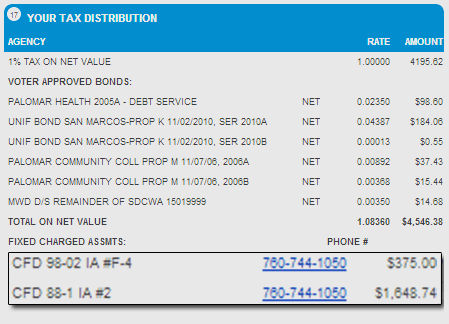 To find out how much you should expect to pay in annual property tax for your San Marcos or Santa Fe Hills home, visit the San Diego County Tax Assessor’s website, search the address or parcel number, and look at the most recent bill. (Note: If the bill does not show up by address, you must use the parcel number. Parcel numbers can be found at the County Clerk website). On the tax statement, Mello-Roos always falls under the “FIXED CHARGED ASSMTS” section. The line items that start with CFD are the annual Mello-Roos tax obligations. What Specifically Does Santa Fe Hills Mello-Roos Pay For? Santa Fe Hills Mello-Roos district CFD 88-1 pays for: street improvements, sewer lines, water lines and facilities, drainage facilities, an elementary school and portions of a junior high school and high school, a community park and a fire station site. Santa Fe Hills Mello-Roos district CFD 98-2 pays for: Public lighting, including, but not limited to; street lighting and traffic signals; parkway landscaping; median landscaping; public or private property required by the City of San Marcos to be maintained as passive open space areas, including, but not limited to, passive open space areas, habitat preservation areas, slope areas, and earthen/natural drainage channels. *Mello-Roos DOES NOT pay for the fences that surround your home, even if your fence borders a public trail or sidewalk. Fence maintenance is the homeowner’s responsibility. If you have questions or information to report regarding any of the Santa Fe Hills public facilities, contact San Marcos Public Works. 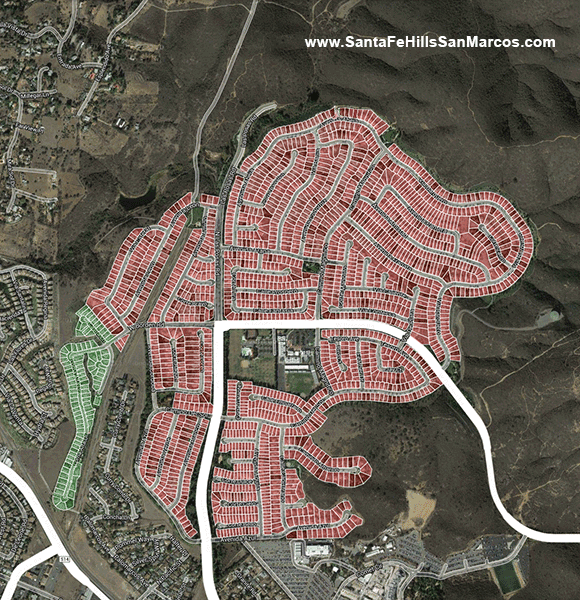 All homes in Santa Fe Hills are part of the CFD 88-1 Mello-Roos/Community Facilities District. CFD 88-1 is subdivided into three separate improvement areas; Improvement Area 1, Improvement Area 2, and Improvement Area 3. (See the example bill above of a home in CFD 88-1 IA #2). The CFD 88-1 tax payments help fund facilities (street improvements, sewer lines, water lines and facilities, drainage facilities, an elementary school and portions of a junior high school and high school, a community park and a fire station site) and services (police and fire protection services). The facilities portion of CFD 88-1 make up a bulk of the annual tax obligation, but this tax will eventually expire. The services portion of CFD 88-1 never expires, and increases by 2% each year. See below for a breakdown. The annual facilities Mello-Roos tax obligations range from $1,393.74 – $2,545, depending on the home. The facilities Mello-Roos tax obligation expires September 1, 2019. The annual services Mello-Roos tax obligation is $151.38 (in FY 2013-14). The services Mello-Roos tax obligation never expires, and increases by 2% each year. The annual facilities Mello-Roos tax obligations range from $1,578.89 – $2,041.47, depending on the home. The facilities Mello-Roos tax obligation expires September 1, 2027. The annual facilities Mello-Roos tax obligation is a maximum of $1,658.39. The portion of Santa Fe Hills built between 1998 and present is also part of the Mello-Roos district CFD 98-2, F-Zone F-04 or F-08. This CFD was created to fund citywide parks, trails, public lighting, and landscaping. The maximum annual tax for CFD 98-2, F-04 or F-08 is $375. This annual fee is subject to increase upon fiscal year 2028-29. Read more about CFD 98-2. Looking at a map on a typical Real Estate website, it’s easy to conclude that there are actually 1,852 homes in Santa Fe Hills. What confuses people is a small subdivision of 94 homes named Loma Alta. These homes are not technically part of Santa Fe Hills (but of course we still treat them as Santa Fe Hills neighbors). 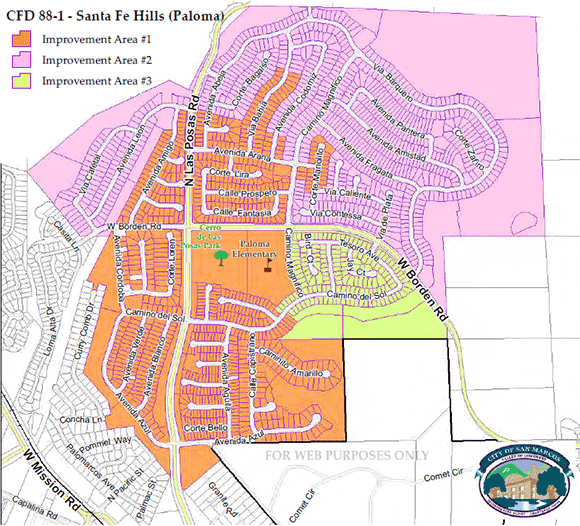 The reason it is important for prospective homebuyers to distinguish these 94 homes as Loma Alta is because Loma Alta has an HOA and is not part of Santa Fe Hills Mello Roos District CFD 88-1. Loma Alta belongs to CFD 98-1 and CFD 98-2. The 94 homes of Loma Alta are located on Loma Alta Dr, Castia Ln and Alta Ct. See map below. The City of San Marcos setup a special webpage with a lot of information about the San Marcos Community Facilities Districts. For questions, please contact CFDinfo@san-marcos.net or call (760) 744-1050 ext. 4506. If you have questions about the San Marcos Unified School District CFD, you’ll have to contact the San Marcos Unified School District at (760) 752-1299. Another helpful resource regarding School District Taxes is this San Diego County School District Bonds and Taxes interactive map.